6202 145YUM 15 Pfg. 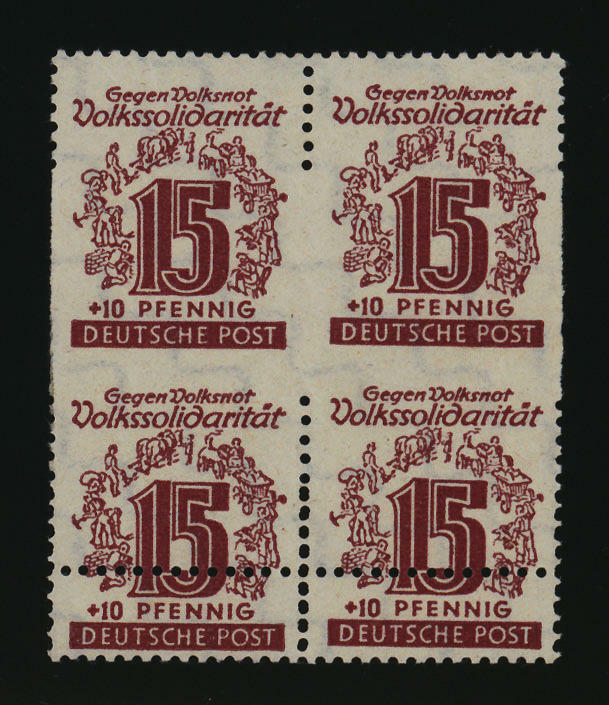 People solidarity, block of four, in the middle horizontal unperforated, vertical partially perforated, lower pair with double perforation, in perfect condition mint never hinged, spectacular variety, Michel unknown, expertized Zierer. 6203 149Xa 60 Pfg. 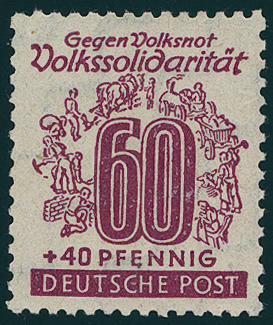 People solidarity 1946 with very scarce \"falling watermark\", fresh colors and in perfect condition mint never hinged there are only about 30-40 mint never hinged examples with this watermark have become known, so that these stamp to the all large rarities of the SBZ counts. Photo expertize \"genuine and immaculate\" Ströh BPP. 6204 ⊙ 149Xa 60 Pfg. 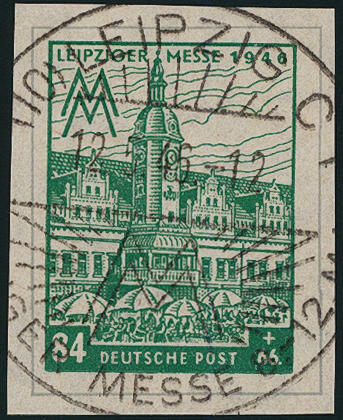 People solidarity 1946 with very scarce \"falling watermark\", fresh colors and neat cancelled \"LEIPZIG 13.3.46. \" in utterly perfect condition. Used examples hereof to class among the all large SBZ-rarity. We could up to now only another piece hereof to offer. By our knowledge are at most 5-6 examples have become known. The here offered counts to the prettiest copies and is also in the Michel special catalogue depicted! Photo expertize \"genuine and immaculate\" Ströh BPP. 6205 153bX 6 Pfg. 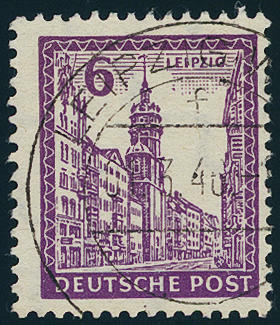 Dark red violet, falling watermark, fresh colors and very well perforated from upper margin, in perfect condition mint never hinged, a very nice copy of this rare colour, photo expertize \"genuine and immaculate\" Ströh BPP. 6206 ⊙ 153bY 6 Pfg. 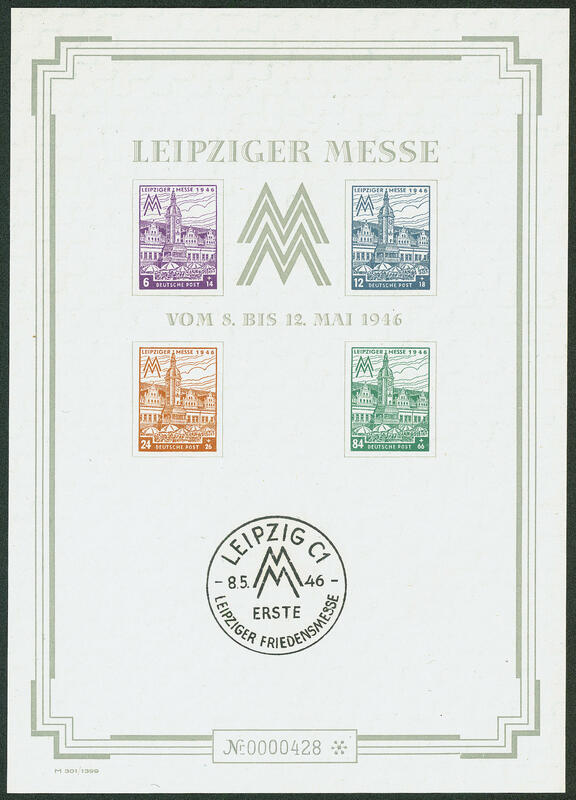 Dark red violet, increasing watermark, fresh colors and very well perforated, perfect used \"LEIPZIG 1.3.46. \", an exception copy of this rare colour for the highest standards, photo expertize \"genuine and immaculate\" Ströh BPP. 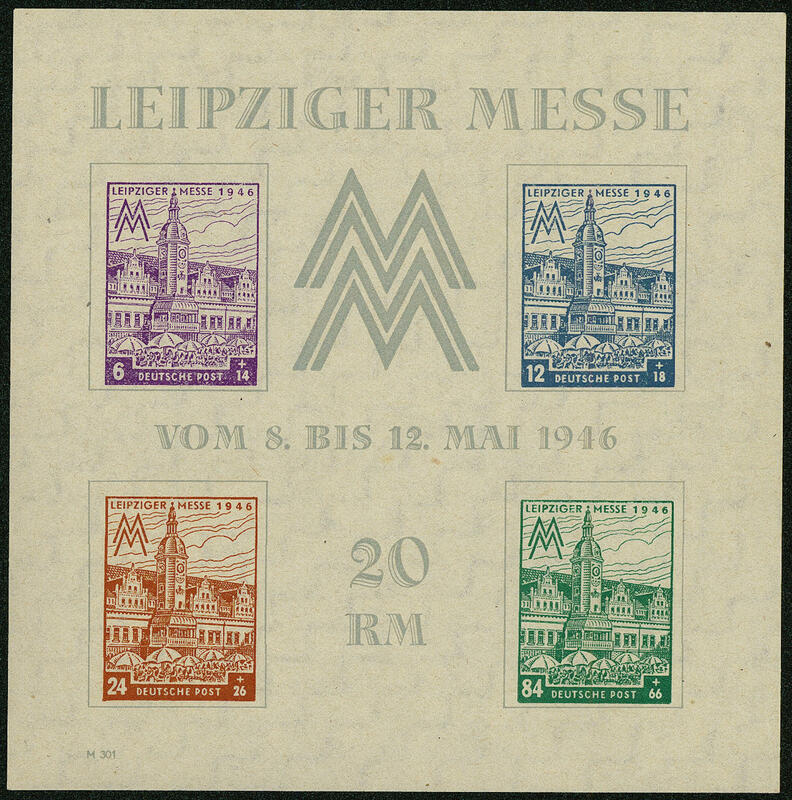 6207 ⊙ 162/65CXZ Leipzig fair 1946, all fours souvenir sheet stamps with the rarely steep falling watermark, uniform with centered special cancellation \"LEIPZIG 12.5.46. \", the seeming most beautiful known set with this rarely watermark. A dream set for your highest requirements! Photo expertize \"genuine and immaculate\" Ströh BPP. 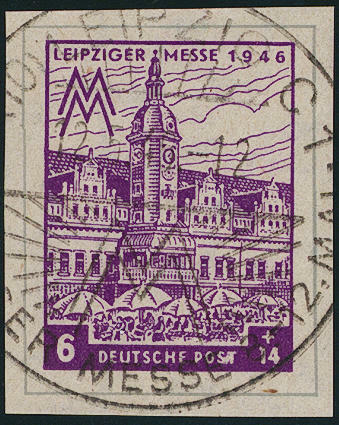 6208 Bl.5bX Leipzig fair souvenir sheet 1946, falling watermark, herewith the 12 Pfg. In of the rare colour gray blue, fresh colors and in perfect condition mint never hinged in perfect condition. In this quality hardly ever offered! Photo expertize \"genuine and immaculate\" Dr. Jasch BPP. 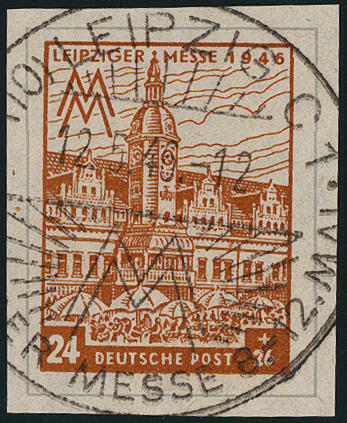 6209 Bl.5SX Leipzig large fair souvenir sheet 1946, falling watermark, without protective cover, in perfect condition. Michel 500,- €. 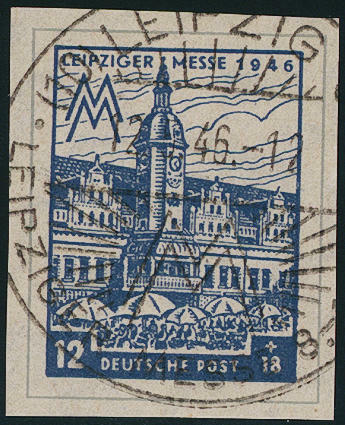 6210 HZ12PXb Leipzig fair 1946, the very scarce center piece cut with falling watermark and 6 Pfg. In blackish purple violet, as well 12 Pfg. In blue-grey unfolded, fresh colors and in perfect condition mint never hinged, without any signs. There are only few examples from this known, especially in such exceptional quality a SBZ-rarity! Photo expertize \"genuine and immaculate\" Ströh BPP. 6211 ⊙ 185b 10 Pfg. Yellowish green, neat cancelled, photo expertize \"genuine and immaculate\" Paul BPP. 6212 ✉ 195aPFä 60 Pfg. 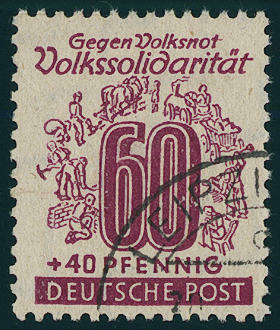 Carmine red with rubber handstamp impression \"Soviet areas occupied by the enemy\", so-called Zschopau postal forgery with additional franking 12 Pfg. 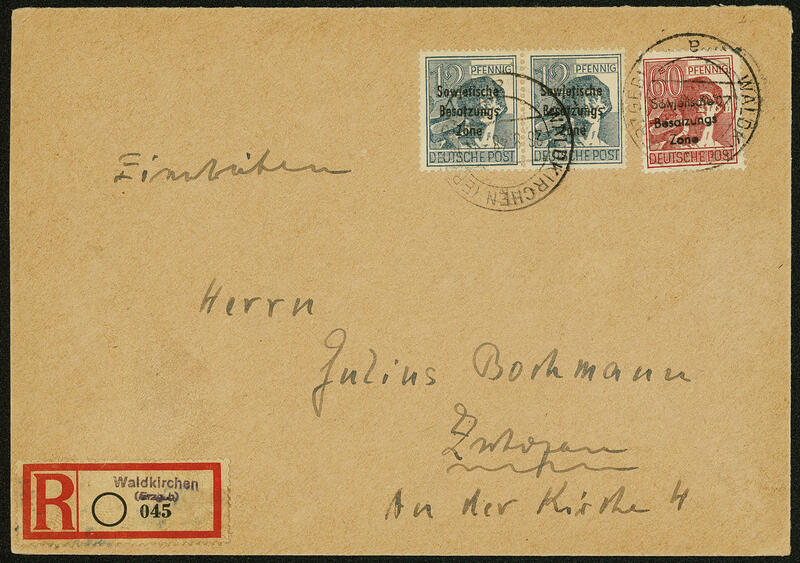 In the horizontal pair with genuine overprint, correctly franked on very nice registered cover from \"WALDKIRCHEN 28.8.48. 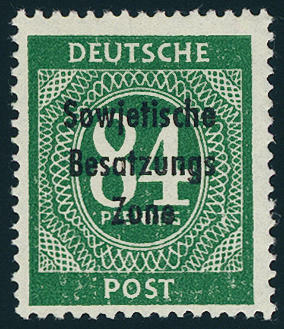 \" to Zschopau with arrival postmark. 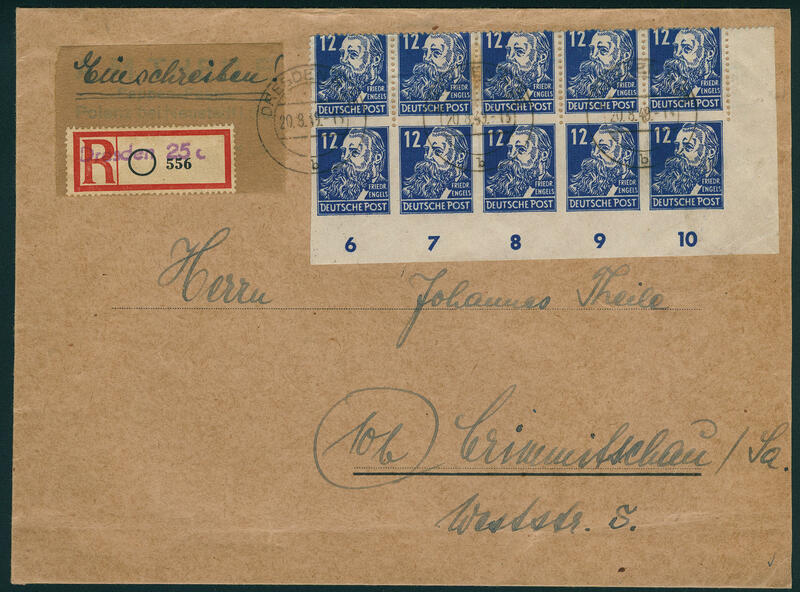 There are only a few letters with this postal forgery have become known! Photo expertize \"genuine and immaculate\" Paul BPP. 6213 211Borken 84 Pfg. 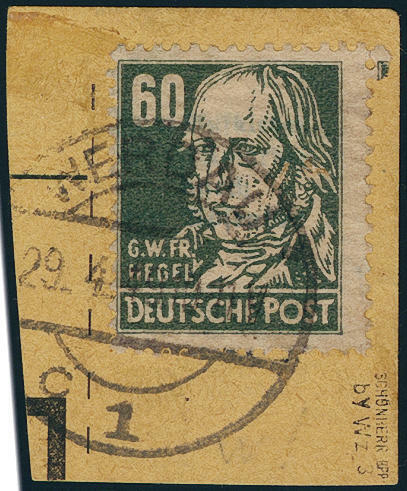 Numeral, machines overprint, with very scarce partial spotted gum, fresh colors and very well perforated, in perfect condition mint never hinged a Soviet Zone rarity, of the very few examples have become known. In the Michel special catalogue unlisted! Photo expertize \"genuine and immaculate\" Weigelt BPP. 6214 214b 8 Pfg. Blackish brownish red, in perfect condition mint never hinged, photo expertize \"genuine and immaculate\" Schönherr. Michel 250,- €. 6215 ✉ 216Uu,Udr 12 Pfg. 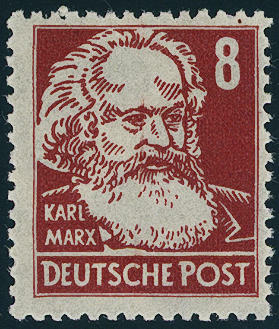 Friedrich Engels, block of ten from of the right lower corner of the sheet, the upper stamps with defective or badly placed perforation and at the bottom unperforated, the lower five values three sided unperforated on registered cover from \"DRESDEN 20.8.49. 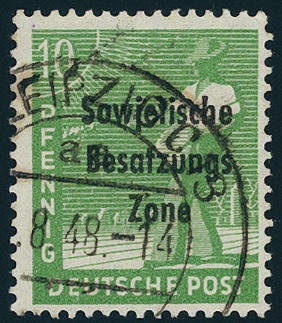 \" to Crimmitschau / Saxony with arrival postmark, in the 2. Weight step almost correctly franked franked. 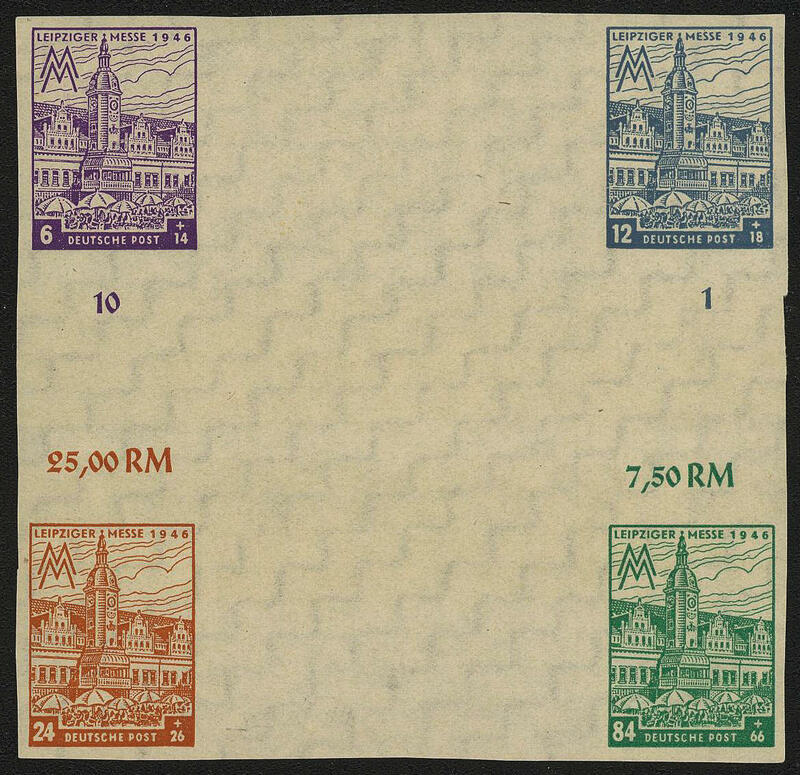 A spectacular varieties mass franking from utmost rarity, in this kind probable unique! Expertized Zierer BPP. 6216 216y 12 Pfg. 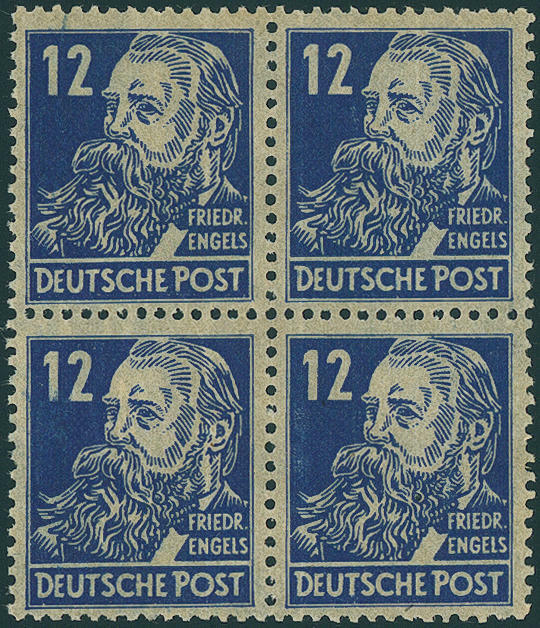 Engels with vertical spotted gum block of four, a value small affixed spot, otherwise in perfect condition mint never hinged, signed Henning. Michel 480,- €. 6217 219UuDZ 20 Pfg. 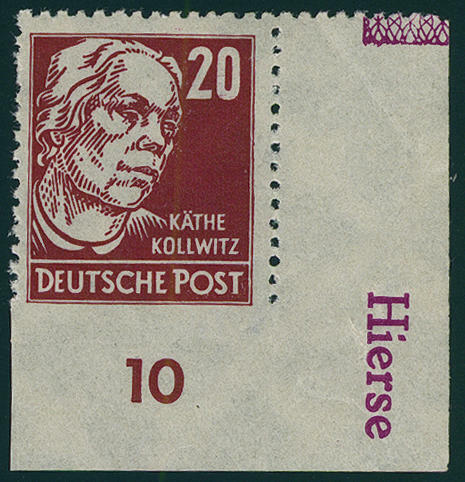 Kate Kolwitz, right lower corner of the sheet at the bottom unperforated with printer sign \"HIERSE\", fresh colors and in perfect condition mint never hinged already as normal stamps are these printer sign rare and sought. In this kind as variety a significant Soviet Zone rarity and probable unique! Expertized Weigelt BPP. 6218 223c 40 Pfg. Dark purple, fresh colors, mint never hinged with easy gum defect, very scarce colour, photo expertize Paul BPP. Michel 750,- €. 6219 ∆ 225bz 60 Pfg. Hegel with horizontal spotted gum, in perfect condition on parcel card coupon, neat cancelled \"WERDAU 29.4.49. \", especially used extraordinarily rare, photo expertize \"genuine and immaculate\" Paul BPP. 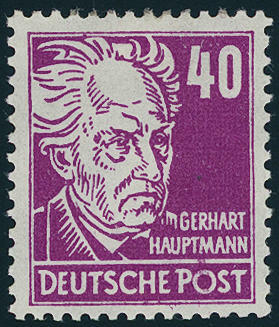 6220 ⊙ Goethe souvenir sheet 1949, fresh colors and in perfect condition with postmark \"KLEINMACHNOW 2.2.50. \". These issue is with date stamp extraordinarily rare! Photo expertize \"the condition is perfect\" Mayer. 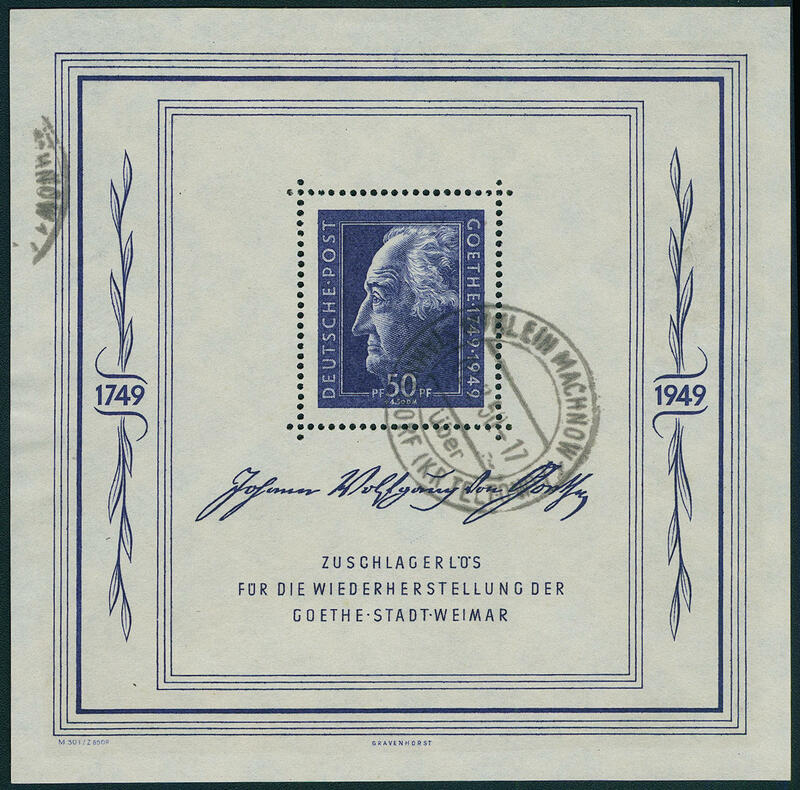 6221 Bl.6 Goethe souvenir sheet 1949, eight piece, in perfect condition mint never hinged, still with the original packaging for formerly 100 commemorative souvenir sheets. Michel 1760,- €.